I hope you had a lovely weekend doing what you enjoy and that you are looking forward to the start of a brand-new week! I've got a medley of cards to share today. First, this card to support my friend Becca Cruger (The Damsel of Distressed Cards), who is running her annual hop to focus on stopping domestic violence. My card has a purple base, matted with a plaid layer and bejeweled with sequints. The beautiful NBUS sediment is from My Favorite Things. The branch and bird are from Memory Box: the branch is from "Meadowbird Branch" and the bird is from "Finnegan Fronds." It's wonderful of Becca to spotlight domestic violence. It's important to talk about the help that is available to anyone who is the victim of physical abuse. It's also good to remember that domestic violence sometimes comes in the form of emotional abuse. Actually, that's true of any relationship. Words can cut deeply and emotional bruises sometimes take the longest to heal. Because our high-level politicians practice schoolyard nastiness and immaturity, it's easy for that behavior to trickle down and be reflected throughout society and in all ages. Kudos to today's parents! It's a lot harder being parents now than it was 30 years ago! Oops, I went off track. That's a hop for another day. Thank you, Becca, for continuing to keep the issue of domestic violence in the light of day and tell your story. Mwah! Double D Challenge: Use plaid. HLS: CASE the Designer: Birgit Norton. Memory Box Challenge: Use sequins. I also made several QACAS cards to send, but I only photographed a couple of them. The hello is from WPlus9, heat-embossed onto vellum in gold, which is reflected in the gold matting. The thanks on this card is from Winnie & Walter. I've had some beautiful sheets of fall leaf PP for ages. I simply fussy-cut the leaves and attached them to pretty embossed paper that I purchased at Michael's while at the Lake House. It's a Recollections "Embossed Neutrals" paper pad in gorgeous shades. EZPZ. Every time I go to Michael's, I stop at the front and ask, "Is Mike here?" Some clerks laugh (he doesn't let everyone call him Mike, you know), but most of them stare through me, hoping I'll just walk on. Which I do. But, honestly, I just want to thank the man. I do the same thing at JoAnn's, only I ask for Jo, of course. You should try it. It's fun. That is a wonderful sentiment, appropriate for so many occasions and for people who face so many different challenges. Love the cards! Gorgeous cards Darnell! I have to admit this is my favourite season for cardmaking, with all the pretty leaves and beautiful warm colours! A great selection of card Darnell. I love the sentiment on the first, it's perfect for anyone facing a challenging time. WOW that is one amazing sentiment.Love it!! I did laugh about the Michael's thing ... Pat is going to NY in a few weeks and hoping to visit Michael's as her first stop ... I'll tell her to do the same... That'll be fun with her London accent! Have a great day my friend! You have been sooo busy by creating these wonderful projects. I can not say which one I like the best! wow, such lovely autumnal cards! Yes, I totally agree with you regarding domestic violence and I support Becca too. Hi Darnell, Loving your cards. The first one is perfect to give encouragement to someone in a bad situation. Domestic violence isn't talked about enough. I love the droplets of rain into the puddle with leaves on your blog. Your cards are fabulous (as always) Darnell and what a beautiful, encouraging sentiment! 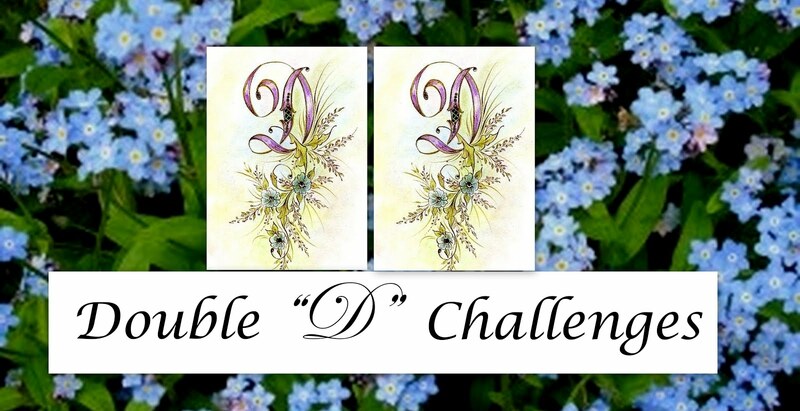 Thanks so much for joining in the fun at our Double D ‘PLAID’ challenge! We hope you’ll come back often. Your cards are all beautiful, Darnell! I love you fall-themed cards but especially your first card - such a powerful sentiment! Thank you for helping to bring awareness to domestic violence. Your card for the hop is gorgeous. What a tremendously important message to get out. Thank you for sharing it. I also really like your quick and easy cards. Such beautiful leaves. And I giggled at what you ask at the front desk. I never once thought to do that. I love your sense of humor! :) Hugs! And have a wonderful week! What a nice card to show that you care about the issue of domestic violence. I have often noticed that no matter how often they seem to replace the pad of cards for the domestic violence hotline that is in the women's bathroom at church, they just get taken so quickly. It makes me think there are a lot more victims than we imagine. Hey girl. Company is still asleep upstairs, so I'm sneaking in a little computer time. Your first card is so perfect for Becca's hop. The bird on the branch is the perfect compliment to that sentiment. The plaid is subtle and lovely. Wonderful card, my friend, just wonderful! And I thought your leaves were real! They are great, and you did a fabby job of fussy cutting; no easy task with all those curves and points! Love them both!! Beautiful quote, very inspirational. Love your card design, Words and innuendos are very damaging to ones self worth. It is such a shame that Domestic Violence is not talked about more but I guess it is not the kind of news that sells newspapers or gets TV presenters very excited.... sadly. Your first card is beautiful, I really love that sentiment! The leaves on your other cards are fabulous, they almost look real! Fabulous BIG and BOLD sentiment...what a worthy cause! Your leaves are also gorgeous! Have a fantabulous day my friend!! Gorgeous cards, Darnell! Love the leaves you used and the sentiment on the first one is wonderful. So appropriate for a variety of occasions! Your purple feature is just gorgeous! Loving the colors, and the cause -- here, here to political NASTINESS (it sure isn't debating or conversing)! Your leaves are so pretty, as well, it's awesome that you fussy cut and highlighted them in your cards! You are just too funny, Darnell! As always, Your cards are wonderful! I especially like the sentiment on the first card. Keep well! I love your two toned purple bird, Darnell, and the message is even better! I totally agree that if all of us would speak encouraging words and not insults, our country would be a much better place. Love your Autumn leaves too! Fantastic QACAS cards! Next time I go to Mike's I'll be sure to ask for him. Thanks for the idea! Love your card and support for domestic violence. It goes on more than we know. I am appalled that our candidates are allowed to speak like they do. What a terrible influence on our country and our youth. Your fall cards are lovely. The paper is so pretty. The leaf on the second card could be right out of my yard, it is so authentic. Fabulous post and fabulous cards! The sentiment on Becca's challenge card is AWESOME!!! I'm totally loving the purple plaid paper! Gorgeous leaf cards too! I can just image you walking into Michaels and asking if he's there! You are sooooooooooo much fun and so good for the soul! My computer is still being STUPID!!! Seems to be affecting our internet as well so I'm sneaking in a bit of posting at work. Have been on the phone with MTS several times. Frustration level is through the roof, so hopefully things will be resolved soon. We don't have a Michael's, but we do have a JoAnn's. I'll have to try that! So true about emotional and verbal abuse being as damaging. You see so many older women who have just stayed in the marriage and been broken by it, which is the way it was done, but not necessary these days. A person can't truly understand until they're in that situation. I have to say... your last card... the leaf... I thought you picked it up from the yard. Back to the top... what a beautiful sentiment, beautiful stamp. I love the bird, too. I'm glad you shared this in our Plaid Challenge at Double D.
Totally fabulous Darnell! And such a great (maybe the wrong word!) subject to draw attention to as well. So much is swept under carpets and so much heartache is hidden. Sweet paper piecing too my friend! Now how the heck have you done that cos it's just starting raining here in little ole England and looky see it's raining puddles on your blog too. Did u know u gotta leak! Hugs Mrs A.
Fabulous sentiment on the card for Becca's challenge! Very appropriate and true.... Love this card! Beautiful also the two QACAS cards you have photographed, great works! Great cards , but the sentiment on the first one is great !!!!!!!!!!!!!!!!! Those leaves! I thought you had plucked them from some trees and wondered how you preserved them.... now I know your secret. Fabulous cards! And no I don't think I'll ask for Mike at Michael's as they tend to be cranky enough as is and at Joann's I'm more tempted to ask "Where's the merchandise?!?!!" EEK. My funny Michael's story is I was at Mike's when the lady next to me answered her cell phone. Apparently she was asked where she was at because she said, "Michael's" and whoever asked her must have been the jealous type because she spent the next few minutes trying to get a word in edgewise: no, it's a craft store, it's a CRAFT store, ART SUPPLIES! on Oracle! Near Target! It's a STORE NOT SOME GUY! Howdy! Welcome home. You have been a busy lady. I love the brusho/stencil card from your last post. This leaf looks real and I had to reread to realize it was designer paper - cool.You make even going to Michael's and JoAnn's fun - funny lady. 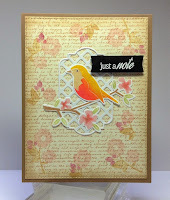 A flourish of beautiful cards Missy D! Each one is a joy to behold but I have to say I love that first one because I love my bird stamps, dies, whatever so much lol! It's so great of you to support the cause with that beautiful card, Darnell. Those leaf cards are wonderful. 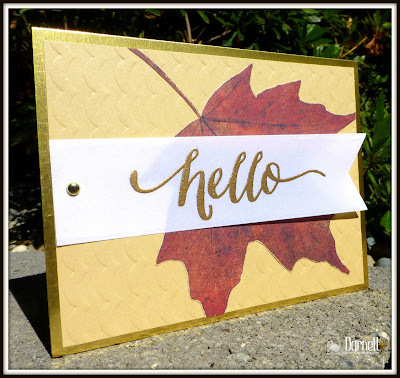 Gorgeous fall cards Darnell! I love that black and white card, so elegant! God bless you sweet girl! That's a wonderful medley of cards - in the "maestro" category, I'd say. Your first card is so inspiring, but of course I love the fall leaves, too. You must have been on a major roll to get so many cards done and dusted. your card for the hop 2 stop could not be more perfect! love! Another trio of amazing cards Darnell - love your purple card - it is perfect. And what a great use of the paper to cut the leaves out and put them against a neutral background. Awesome cards. How is Hammy these days - very quiet by the sounds of things, has he not recovered from all the travelling? Great sentiment Darnell and with you 100% on your views! Love your autumnal cards those leaves are fabulous. Would love to be with you when you left foot the assistants in Michaels! Beautiful cards and a very worthy cause. Always so happy when I stop by and see your beautiful cards! Have a lovely day!!! OMG, your last paragraph just had me laughing so hard! I can just imagine asking for Mike or Jo ... why are so many people afraid to joke or laugh?! I just don't get it. Anyway, LOVE your card. The sentiment is fabulous! And I'm a birdie lover, so of course the bird just speaks to me ... especially in purple. lol Awesome card. Thanks for playing along at ATSM! Your cards are awesome. 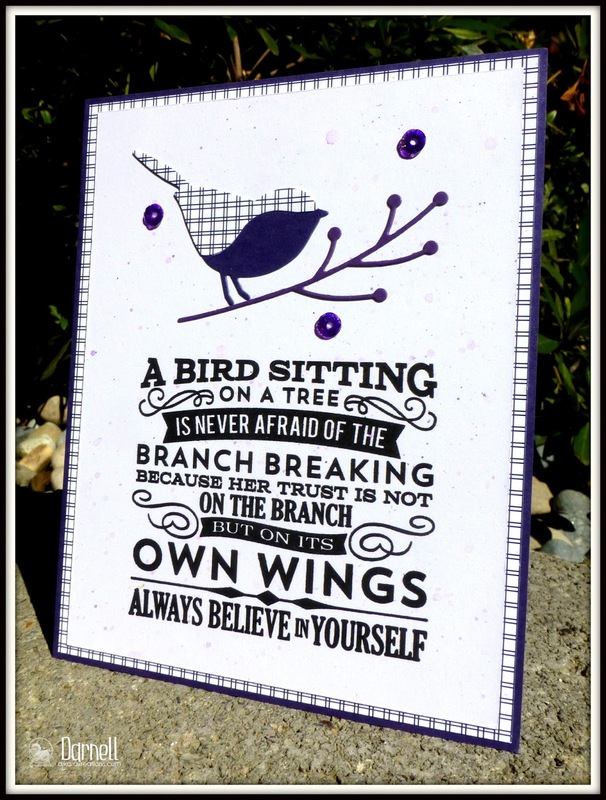 That sentiment is perfect for this blog hop and paired with the bird on the branch makes for a wonderful card! And your thank you cards might have been quick and easy but are definitely fabulous! Oh Darnell I have missed you so and it was lovely of you to pass by and leave a comment. Your first card is so beautiful and the sentiment is so true and very up lifting. Looks beautiful with that gorgeous foil. The leaf cards are so autumnal with beautiful colours and texture. I spy with my little eye . . . three beautiful cards! Loving the autumnal ones with the glorious colours. The sentiment on the first card is AWESOME. Autumn is YOUR muse for sure! WOW! That's all I have to say after seeing that big ol' bold sentiment of your first card. It made me tear up just a little bit, so you know it's a doozy. Your post is also wonderfully penned. There has never been an election cycle that has made me feel more defeated as a woman. As for your QACAS cards, I stared at those leaves trying to figure out if they were real before I just did the obvious thing and read the text below. And lastly, I am now ALWAYS going to ask for Mike at the front desk of Michael's. HAHA! 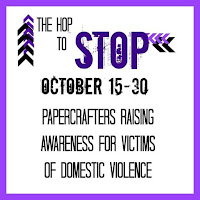 Oh wait - not lastly - LASTLY: Thanks for creating a card for the Hop to Stop and helping to raise awareness for victims of domestic violence! What a great hop to stop card. Your card is such an uplifting card! Your fall leaf card looks like you went outside and picked a leaf and used it on your card! Thanks for the alert to this hop, Darnell. Took me a while, but I got a card done. Purple and pink are my favorite colors...well, and blue, and red...you understand! You are so funny - looking for Michael & Jo! I love your cards. The colors and designs are just fabulous. What a lovely collection of cards here Darnell! I'm so glad you linked this up to the Happy Little Stampers CASE the designer challenge. 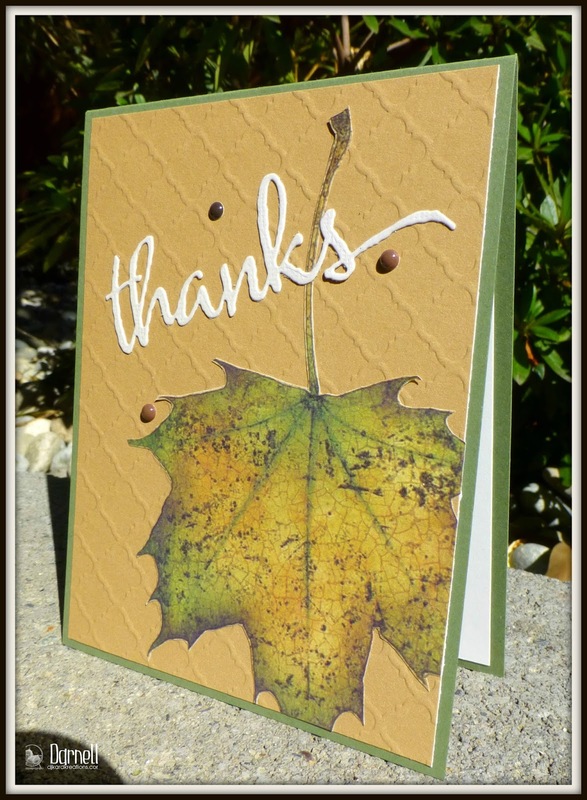 Such pretty Fall cards & a wonderful Hop to Stop card, Darnell! Love that quote! I wonder if there actually is a Mike? Or JoAnn? Their names must have come from somewhere?? Your CASE of Birgit's card is so pretty and love your navy and white colour combo too. Sounds like you had another wonderful trip to the Lake House, would have loved to have been a fly on the wall. And thank you so much for joining us at Happy Little Stampers too! Your card for Becca's hop: powerful and beautiful. Yes, the 'big world' still has a long way to go to embrace respect and kindness for all. Sighhhh....On another note: your leaves - maple ones, at that - have my Canadian heart smiling! Gorgeous! Mike and Jo...too funny! What a great sentiment that is, and complemented beautifully by that sweet bird on a branch. Love the leaf cards (and thank you so much for mine! ), and I;m fascinated by the leaf puddle! Congrats on the win at HLS Case The Designer! Such an awesome card, color and that fabulous sentiment!